Financed by the Flemish Government and organized by UNESCO and its space partners, in particular Planet Action, this exhibition uses a series of remarkable examples to demonstrate the use of satellite Earth observation to assess the effects of climate change on selected World Heritage sites. The Intergovernmental Panel on Climate Change (IPCC) states that ‘global warming is unequivocal' and is due largely to an increase in atmospheric concentration of greenhouse gases, such as carbon dioxide (CO2), caused by the burning of fossil fuels. From 1993 to 2003, the global mean sea level rose at a rate of about 3 mm per year. Thermal expansion of the oceans and widespread melting of land ice will result in further global sea level rise. Reduced rainfall, higher sea and land surface temperatures, more severe storm events, ocean acidification and rising sea levels are all expected to have a significant impact on World Heritage sites. The conservation of natural and cultural heritage may be jeopardized by climate change. Glaciers are melting, coral reefs are exposed to bleaching, and terrestrial biodiversity is being affected. Increasing sea levels threaten many cultural sites located near the coast, and other aspects of climate change are affecting ancient archaeological sites. Space-based sensors have the capacity to measure essential climate change variables. Overall comprehensive monitoring using space technologies is made possible through collaboration among nations around the globe. 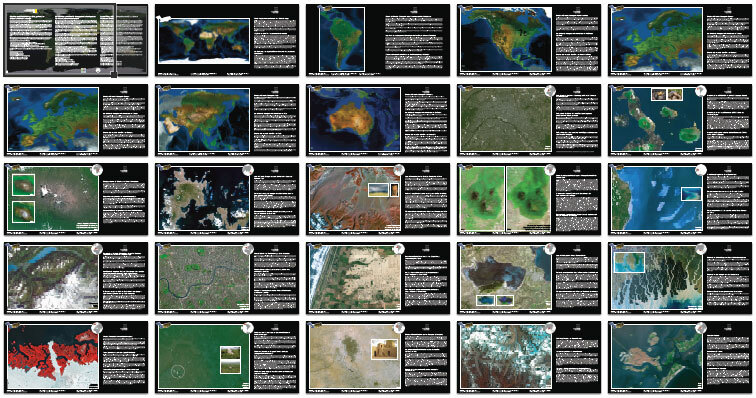 Ten Years of Imaging the Earth (Belgian Federal Science Policy Office, 2009). ESA - UNESCO Open Initiative: From Space to Place joint projects between UNESCO and space partners.